There’s definitely something about summertime that makes us want to try new things. By new things we mean something high, something thrilling, something heart stopping, something that would make us feel more alive. And yes, we also mean AJ Hackett Sentosa – the best place to feed your hunger for the ultimate adrenaline-filled experience. AJ Hackett Sentosa opened in late 2017 due to rising public demand for a place where everyone can get their YOLO moments. 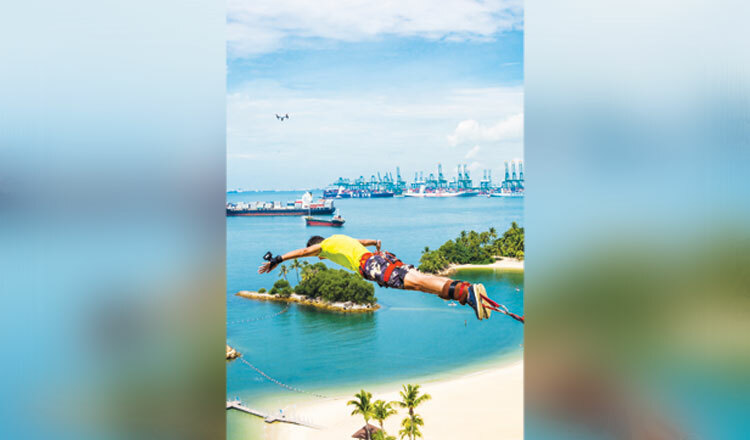 Originally from New Zealand, AJ Hackett is Singapore’s first and only bungy tower to date, with a purpose-built structure that can be used for different aerial activities. This new attraction in Singapore has a platform that stands 50 meters above the ground on Siloso Beach, Sentosa Island, where everyone can give in to their souls’ desires – to live fearlessly. Thrill-seekers can choose to drop, swoop and scream (well, screaming isn’t really an option) on the Giant Swing, or challenge themselves and push their own personal limits on the 47-meter Bungy Jump. And if once is not enough to satisfy your thirst for a heart racing time, you can make a few more jumps in different styles.. The Skybridge, meanwhile, offers a 40-meter walkway with see-through sections. On it is the Paulaner Sundowner Deck which has the best sunset views in Siloso. There isn’t an age requirement for these exciting activities, but participants must meet weight and height conditions. And you really don’t have to worry about anything. AJ Hackett assures that you’re taken care off – safety gears, tight strap, and a jump master that will make you feel at ease. In any case, since you are facing down the beautiful Siloso Beach and the Singapore sunset, you’ll likely forget your fear and doubts as you drink in the breathtaking views. Let go, jump, scream – and in just a matter of seconds, you will discover that this is the kind of thrill you’ve been dreaming for so long! Will you take that leap towards an exhilarating experience? Say yes, and visit www.ajhackett.com/sentosa for detailed information on the activities the attraction offers. Remember, YOLO.